Home › 3 Modes Rotating Star Light Projector Hallomall 4Led Romantic Night Lamp Proj..
3 Modes Rotating Star Light Projector Hallomall 4Led Romantic Night Lamp Proj.. 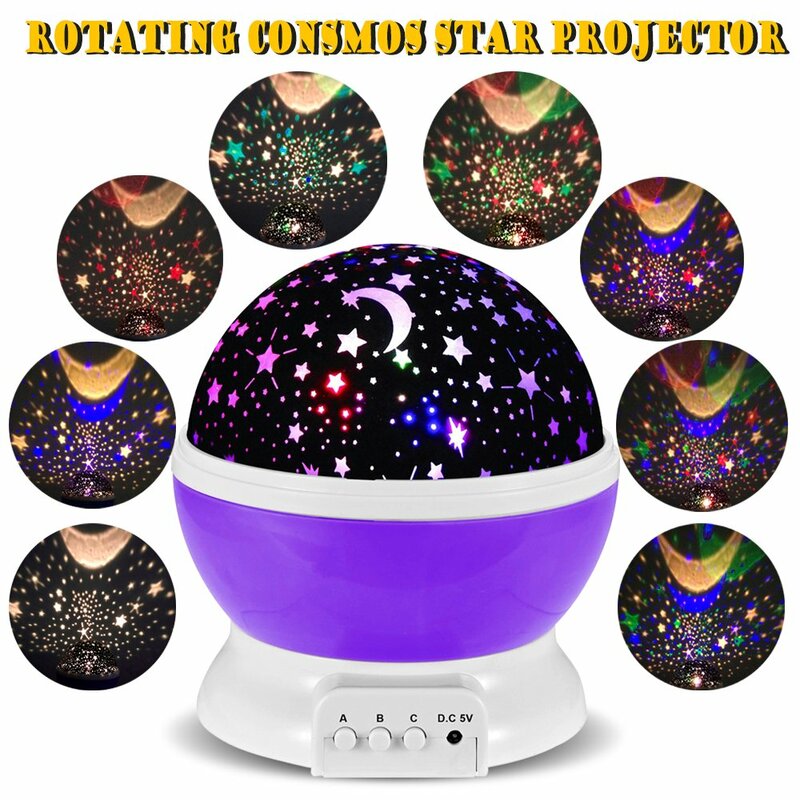 Newest version with 4LED Bead/3Modes, projects sky moon and star light, shape into romantic cosmos star sky, perfect for Wedding Decorations, Baby's Room etc. 3Modes, Warm night light(button A); Color-changing mode (gradually change between blue, red and green); Rotation Mode(button C). Power Supply: Batteries powered( 4*AAA batteries, not included), or DC5V/USB cable ( AC adapter not included). Projector or Non-projector function, with the frosted cover on, the light could be as a projector; without the frosted cover on, the light could be as a night lamp. More bright, 4LED version, larger lighting range than the old one. Color: Purple Specification: Power: 3W Voltage: DC5V LED quantity: 4 LED color: warm white, red, blue, green Power source: 4AA batteries(not included) DC5V USB cable USB cable length: 3.1ft Product Dimensions: 4.724.725.31in Product Weight: 9.31oz Package weight: 12.1oz Hallomall Lightweight Lamp Projector 1, it's equipped with 4 bright LED beads(warm white, red, blue and green) 2, 3 simple push button controls to get different combinations of lights (fromplain white, to colors, to flashing, and revolving or stationary), which willmake the room more gorgeous and colorful. 3, with the frosted cover on the light dome, it could be regarded as nightlight rather than a show light. 4, Get the frosted cover taken off, it offers a stunning starry light showingon the walls and ceiling. Switch Modes-Using A: Power the light On and Off (warm light) B: Cycle through color options and turns on blue or purple stars over theyellow C: Turn on the rotating motion option and make stars and moon spining on theceiling and wall Worry-Free Warranty: 1.At Hallomall, we will always stand behind our products within one year. 2.As to the Amazon Fulfillment order, if the order time is over one month andthe return window is closed, please click the contact seller customer servicefor help by choosing "product details" subject to request a replacement or arefund.